What Happens When the Biggest Buyer Leaves the Market? Housing on a Sugar High? In an April 8, 2013 MSN video interview with former Fannie Mae Chief Credit Officer, Ed Pinto, Mr. Pinto explains the fundamentals of the housing market and how the "wealth effect" fueled by artificially low interest rates and abundant borrowed money, rather than increasing incomes, is effecting housing prices (and other asset prices). In a February 12, 2012 video interview, Warren Buffett, “The Oracle of Omaha” comments on The Institutional Home Buying Bubble, ‘bulk’ single family home property management, record low interest rates, home price values and risks, and suggests that buying a home is a good way to “short-the-dollar”. April 30, 2013 - A few days ago I was watching a video-clip of former Fannie Mae Chief Credit Officer, Ed Pinto, discussing the Fed’s artificially induced low interest rates, his views on their effect on home prices, and his views on their effect on what many are calling the current housing market ‘recovery”. At approximately two-minutes-and-thirty-seconds into the video interview, Mr. Pinto says, ‘These low interest rates are starting to make people buy houses the way they buy automobiles.’ “They don’t ask what’s the price? They ask what’s the monthly payment?*. Mr. Pinto’s comparison of the economics of home buying, to economics to automobile buying, ignited my curiosity. I began to wonder . . . how are automobile prices, auto financing, and auto sales reacting to this artificially low interest rate environment? This morning I did a key words search on: ‘low interest rates auto sales’. Spring is finally here, and the jobs picture is brightening--but the biggest factor in rising car sales could be easy money. March 2013 car sales are being reported today, and for the most part, all the brands sold in the U.S. are posting moderate gains over the same period a year ago. Subaru and BMW are up strongly at 13 percent each, while the domestics are showing single-digit gains. Only the South Korean brands so far are down, with Kia posting the least encouraging numbers of the news cycle. In all, the seasonally adjusted annual rate (SAAR) in March is expected to reach 15.3 million units, according to a joint survey from J.D. Power and Associates and LMC Automotive. That would be flat against February's numbers, despite the average retail price of a new car going up 3 percent, to $28,504. The retail sales SAAR of 12.1 million units should remain unchanged as well. What's at the root of continued healthy sales? J.D. Power and Associates senior vice president of global automotive operations John Humphrey says that the steady upward pressure of price has pushed buyers into longer-term loans, but says shoppers also are leasing more, as well as capitalizing on low interest rates. Bankrate.com's average for new 48-month auto loans currently sits at 2.44 percent, near historic lows. "While longer loan terms have traditionally been a cause for concern to the industry due to the risk of purchase cycle extension, it is not necessarily as daunting as it may seem." said Humphrey. "The longer loans are being offset by more leasing and the low interest environment, which means that consumers are able to put more of their monthly payment towards their loan principal rather than interest fees." The financial climate's led Power partners LMC Automotive to hold its forecast for total 2013 light vehicle sales in the U.S. to 15.3 million units, with the retail sales forecast holding at 12.5 million units. "We expect the economic environment to improve throughout 2013, as the likelihood of a dark cloud slowing the recovery pace diminishes," said Jeff Schuster, senior vice president of forecasting at LMC Automotive. "Consumers do not appear phased by headwinds from Washington." The automakers themselves are upbeat about prospects for the remainder of the year. GM predicts a SAAR of between 15 and 15.5 million units for the year; Chrysler estimates the March SAAR at 15.6 million vehicles, including retail and fleet. Do you think lessors are actually increasing their up-front lease contract payments? At what point - in a 48 month purchase or lease contract - does the obligor / purchaser have positive equity in the auto? Are those buyers who are using these methods to finance rapidly depreciating assets (automobiles) economically sophisticated enough to make decisions without close supervision? (1) Actually, I don’t believe this is a recent phenomenon. I think, when buying a home, most people consider how much they can afford. or are willing to spend on their mortgage payment, then they buy as much house as that payment will allow. Every real estate sales person I’ve ever met encourages this approach to home buying and home affordability. and, Congressman Hank Johnson on 'midgets'. I did some key-words-searches to verify such a study exists, and I found the study to which Mr. Hulbert is referring. The study was conducted by a former commodities trader for Trust Company of the West, Claude Erb and a Finance Professor at Duke University, Campbell Harvey. (2) The study is based upon a time series of rates of inflation as compared to the fluctuations in value of the hedge against inflation (gold). The study puts the mean value of gold, over a long historical time series, at approximately $800.00 per ounce. It’s also interesting to note, recent industry estimates for the average costs-of-production for one ounce of gold are approximately $600.00. (3) Which raises the question, what premium should a gold buyer pay, to buy the next ounce produced, of a commodity which costs $600.00 per ounce to produce? Or, expressed another way, what is the fair-market (competitive) profit one should expect for producing an ounce of gold? In November of 2012, immediately after U.S. Federal Reserve Bank Chairman, Ben Bernanke announced the implementation of Quantitative Easing II, Professor. 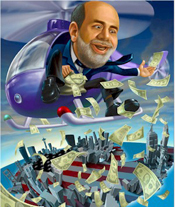 Nassim Taleb contacted Bloomberg News interviewer Erik Schatzker to say, “Something has to be done about Ben Bernanke". Mr. Schatzker invited Prof. Taleb to discuss his feelings on Bloomberg Television’s “Inside Track” program. The video-clip below contains two brief 'slices' from that interview. Is The Housing Market on a Sugar High? In an April 8, 2013 MSN video interview with former Fannie Mae Chief Credit Officer, Ed Pinto, Mr. Pinto explains the fundamentals of the housing market and how the "wealth effect" fueled by artificially low interest rates and abundant borrowed money, rather than increasing incomes, is effecting housing prices (and other asset prices). It's Not Nice to Fool Mother Nature . . . or, Free Markets. 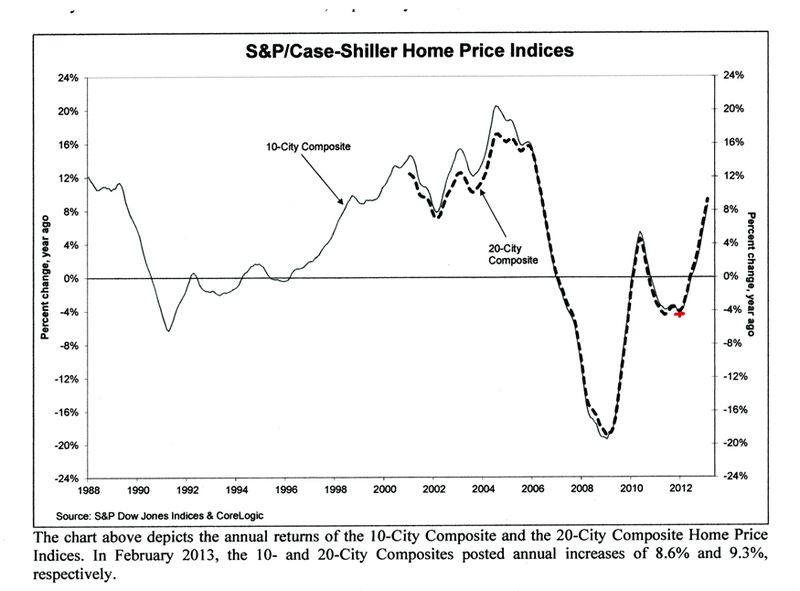 Did Timothy Geithner Fire Economist Robert Shiller? It’s widely recognized that Japan’s “Lost Decade” was a consequence of the deflation of an asset bubble. * Since reading how Geithner was in a unique position to witness the formation and the consequences of a severe asset bubble, and because I believe he has no doubt followed the efforts of the Japanese Government to stimulate its way out of its economic doldrums, I’ve found Mr. Geithner’s policy positions a little strange. For me, the strangeness of Treasury Secretary Geithner’s policies took on an even more strange dimension this morning. This morning I was watching a video of a May 11, 2009 New Yorker Summit presentation of a conversation between Nassim Taleb, Robert Shiller(3) and Nick Paumgarten. At about 4.5 minutes into the video Robert Shiller describes how, after being on the New York Federal Reserve Bank’s “Academic Advisory Panel” for 14 years, Timothy Geithner ‘fired’ him (presumably for Shillers presentation to the panel on asset bubbles). Shiller’s ‘firing’ took place shortly after the first meeting of the "Academic Advisory Panel" after Geithner’s appointment as President of the New York Fed. * As much as most economists agree on anything, most economist’s attribute Japan’s “Lost Decade” to the [changed] wealth effect and loss of confidence which followed the late 80’s early ‘90’s bursting of the Japanese commercial real estate bubble, which had inflated excessively during the early-to-mid 1980’s. In a PBS NewsHour interview aired January 21, 1998, the day after President Clinton was inaugurated into his second term of office, President Clinton explains the origins of sub-prime lending.